I was originally going to do this as a small painting but thought it would be more impressive as a larger piece. 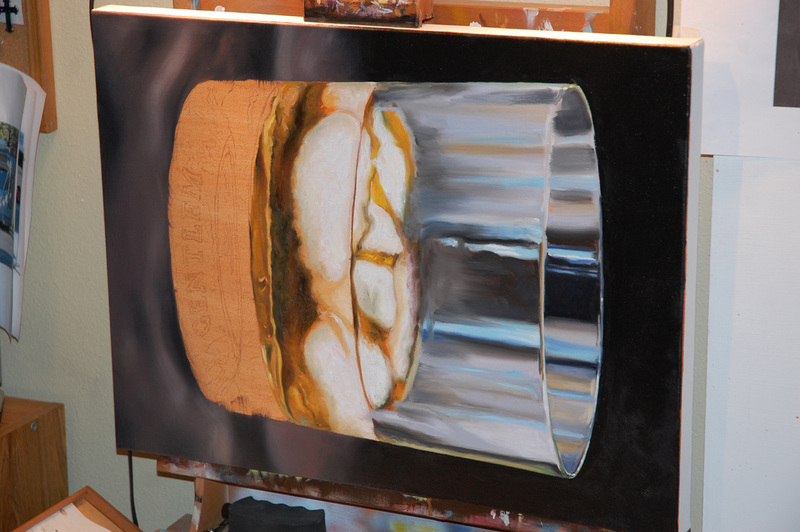 Painting reflective and translucent surfaces are always a challenge because of the distortions and warped imagery they produce. Painting chrome is another one. I like painting these types of surfaces. This painting took some time to do because I had to break down my studio at two different times to have our wooden floors replaced due to a moisture problem which caused a lot of damage. But I finally got it done! When I started this painting I washed in a raw sienna ground for the base over my penciled rough. This painting was at a good size so I had to do a lot of rotating while using a maul for support. Working on the last 4th. Here I'm working on the final stages. I’ve been staring at this drawing for about six or seven months and finally got around to painting it. Blondie passed in June of 2012 leaving a pretty big hole in our hearts. I was trying to figure out how to render the background. Either I render it as a detailed backdrop or a vignette of some sort. Then I saw a figurative painting in which an artist used a palette knife to lay in the background and I had my “a-ha“ moment. So here it is and I’m happy with the outcome. This time around I did a Burnt Siena acrylic wash to set up my under painting. Using a palette knife I painted in the background. Laying in color to her torso and legs. The initial pencil drawing with several coats of spray fixative. A mixture of turps and burnt Umber were scrubbed into the canvas and then wiped off with a paper towel. Here I started in setting up my shadows and at this stage painting in Blondie’s face. Adding some finishing touches and details. The first time I saw the bust of this Indian head I’ve wanted to paint a portrait of it. It was an artifact a friend of mine had in his home. A piece he brought back from one of his many trips, over the years, to India. I was able to sit in and do a few studies of it, as well as, take a few photos for further reference to use later. Here’s the final pencil sketch in all of its glory. 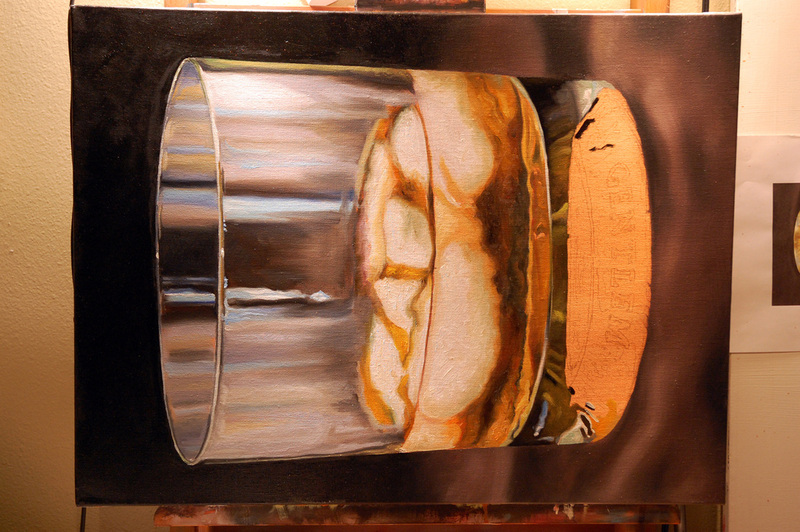 I started the under painting late on Friday evening after I finished my Pencil work. Working on the final color stage. Here's a quick peak at my studio setup. Nice, tight and cramped. More like a cell. This one I'm still discovering and have been wrestling with in terms of how I am going to finish. It's still in a fluid state with this one. The Indian in the middle will be revised due to the fact that I just don't like how he turned out facially. I don’t think his features are working out for me. We’ll see in a later update how this will manifest it its final state. 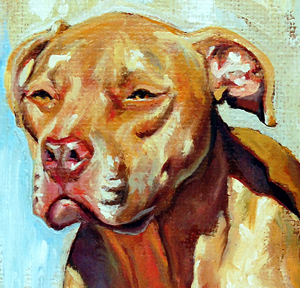 This is a portrait I’m doing of our pit bull Blondie. She passed away in June of ’12. Real heart breaker. This painting has been sitting in a backseat of sorts. It’s in its final stages though.